Boomerang: Travels in the New Third World by Michael Lewis. New York: W.W. Norton Company, 2011. xxi, 213 pp. Michael Lewis is the best-selling author of The Big Short, The Blind Side, Liars Poker, A New New Thing, and eight other books. Many books have been written on the causes of the great economic crisis of 2008, including the author’s own The Big Short. 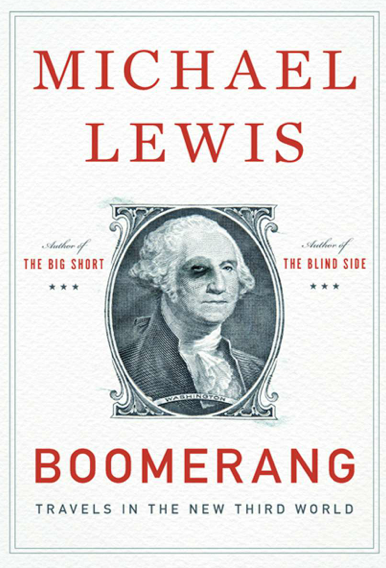 In Boomerang, Lewis looks at the financial crisis in Europe, which represents a part of the ripple effect flowing from the subprime crisis in the U.S. We tend to lump this into the European crisis, but Lewis explains it is a series of quite different crises, where each country had its own unique factors. To develop his story, he spent time in four different countries of Europe, doing research, meeting with leaders, and talking with people on the street trying to understand what went wrong. The first major part of the book consists of a chapter each on Iceland, Greece, and Ireland. Iceland was plagued by young bankers who knew nothing of adversity, some of them trained in the U.S., some who put their fishing careers aside to become investment bankers. Their insolated, local banks and economy took a position in the world economic system through leveraged investments that dramatically collapsed when the downturn began. They speculated on the world. The Greeks invented math, but didn’t use it. They entered the European Union on the premise of fiscal responsibility that simply did not exist, nor did the culture support moving in that direction. The Irish speculated as well, but it was more internal than it was in Iceland. Buying real estate as if it always went up put their banks in a highly leveraged position and resulted in collapse when real estate values began to drop. Each of these chapters is presented with faces and names demonstrating different types of exuberance and naiveté. The final two chapters take us to Germany and the U.S. Today, Germany represents the strongest economy in Europe. The impact of the financial crisis did not come from their own fiscal irresponsibility, but rather from a disciplined culture that assumes others also have a disciplined culture. Some of his descriptions are “slap stick” funny. In the U.S., Lewis moves beyond banks, real estate, and other financial institutions to see the impact of the crisis on state and local governments. As Lewis does so well, he takes us to the people of a real city, in this case Vallejo, California, to see how the economic crisis affects fire and police protection, and subsequently, individual lives. There is far less humor here. Typical of Lewis, his writing is alive with real people, insight, and humor. But this is not a particularly hopeful book. He asks big questions, but is not even sure of the existence of answers to these questions. The subtitle of the book, “Travels in the New Third World” raises fundamental questions about the economic future. Often Lewis is the master of the overstatement, and that may be the case here as well. But I would recommend the book to anyone who is asking fundamental financial questions.